Perhaps no other neighborhood library in the South Georgia Regional Library System was built amid more controversy than the Walter R. & Dorothy S. Salter Memorial Library in Hahira, Georgia. For many years, the public library consisted of a few thousand books in a small room in City Hall, operated by Jackie Matthews and open only on Thursday afternoons. Then, the state of Georgia launched a massive grant program to its cities, promising funds that would pay 90 percent of construction and furnishings to local governments that matched funds and provided land. Hahira citizens found their population was divided down the middle, torn between serious water and sewage needs and their own public library. But, in the end, Hahira, which was known during the 1920s as the Queen Bee Capitol of the World, received a honey of a library, which opened on March 12, 1989. The library acquired its name from Walter R. Salter, a former mayor, councilman, and local business owner who had long desired a library for the community. Upon his death in 1984, the dream unrealized, his wife Dorothy came forward with a gift of $30,000. 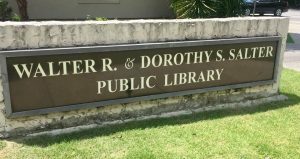 Dorothy was present at the library's formal dedication and Clara Vinson was named as the first manager. Salter Hahira Library is widely used by educators and home school families for its outstanding programs, the Salter Hahira Library has earned a reputation of utmost friendliness and hospitality. It has become without a doubt, a true community center for Hahira’s citizens, and a touchstone for storytelling enthusiasts, well worth the miles one must travel north to visit. The library underwent an $80,000.00 renovation (interior and exterior) during the summer of 2010. Cauthan Construction Company completed the work. Mon - Thurs: 11 a.m. - 7 p.m.
Fri: 11 a.m. - 5:30 p.m.
WHAT MAKES THIS NEIGHBORHOOD LIBRARY UNIQUE? Known as “the small town library with down home appeal,” its strengths lie in the contagious charm of its customer service and its professional and dramatic children’s programming! concerning VA benefits and services. Suitable for ages Birth - 4 years. Call to reserve ~ space is limited. Come for exciting Lego challenges! Lively discussion on selected titles. Reading of selection not required. Adult Computer Instruction: : Learn everything from using a mouse to mastering Microsoft Office programs with these self-paced online tutorials. All you need is your library card to get started! Free monthly craft/activity for children. Join other Lego enthusiasts for a monthly building challenge. You bring the skills; we supply the bricks! All Ages. If you like spirited discussions about books, join us for this monthly meeting. Reading of the selection is not required. Occasional guest author/speaker. Learn what services are available to veterans. First-come-first-served basis. Free monthly craft/activity for teens. Summer Reading Program: Late May through late July ~ Completed reading log grants access to an age appropriate treasure box. Weekly crafts/activities for children, teens, and adults. Prize Drawing at system wide end-of-summer celebration. Designed for children, teens, and adults.